The cops shot 16-year-old Mariam in the back on 28 January, a live round fired from the roof of the Saida Zeinab police station in the cof Cairo's old city at the height of the government violence aimed at quelling the revolution, a pot shot of contempt by Mubarak's forces for the homeless street children of Egypt. She had gone to the police with up to a hundred other beggar boys and girls to demand the release of her friend, 16-year-old Ismail Yassin, who had already been dragged inside the station. Some of the kids outside were only nine years old. Maybe that's why the first policeman on the roof fired warning bullets into the air. Then he shot Mariam. She was taking pictures of the police on her mobile phone, but fell to the ground with a bullet in her back. The other children carried her to the nearby Mounira hospital – where the staff apparently refused to admit her – and then to the Ahmed Maher hospital, where the bullet was removed. Ismail was freed and made his way to Tahrir Square, where the pro-democracy protesters were under attack by armed men. He was wandering up Khairat Street – drawn towards violence like all the homeless of Cairo – when an unknown gunmen shot him in the head and killed him. They are everywhere in the capital, the 50,000 street children of Cairo, Mubarak's shameful, unspoken legacy, the detritus of the poor and the defenceless, orphans and outcasts, glue-sniffers, many of them drug-addicted, as young as five, the girls often arrested and – according to the children and charity workers – sexually molested by the police. Egyptian government statistics claim that only 5,000 beggar children live on the streets, a figure which local non-governmental organisations and Western agencies say is another Mubarak fantasy to cover up a scandal 10 times as big. Children interviewed by The Independent on Sunday, however, have also revealed how Mubarak supporters deliberately brought children to the outskirts of Tahrir Square to throw stones at the pro-democracy supporters, how they persuaded penniless street kids to participate in their pro-Mubarak marches. Swarms of other children forced their way into the square itself because they discovered that the protesters were kind to them, feeding them sandwiches and giving them cigarettes and money. According to one local Egyptian charity, as many as 12,000 street children were caught up in the opposing street demonstrations of the past three weeks. "They were told it was their duty – a national patriotic act – to throw stones at the demonstrators, to do violent actions," said an Egyptian doctor in Saida Zeinab. According to the same woman, many children were hit by police rubber bullets when they found themselves on the side of the pro-democracy demonstrators. At least 12 from this district alone were taken to hospital with wounds caused by police weapons. Ahmed – he is not sure if he is 18 or 19, but is probably much younger – saw Mariam shot. Dressed in an orange T-shirt, faded jeans,plastic sandals and a blue baseball hat, he was shy and frightened, even though the Saida Zeinab police station was burned down by angry crowds later on the same night of 28 January – when the cops fled. "It was just before Friday prayers and we heard the police were beating people in the street," he said. "I went out and saw lots of people throwing stones – so I started throwing stones at the police. "Everyone was throwing stones, my family, every family, because everyone hated the police. "Mariam was taking pictures on her mobile and the police were on the roof. She had her back to the police station, but they shot her anyway. People took her to the hospital and she came out bandaged, but she said the wound still hurt and she thought someone had stolen one of her kidneys. I saw her on the street afterwards, in the Abu Riche area. Now I don't know where she is." Children's hostels – operating with British as well as other European donations – have tried to find Mariam, but to no avail. Ahmed was in Khairat Street when Ismail Yassin was shot. "I was beaten and hit by a 'cartouche' from a police stun gun. A lot of the young people went into the streets to steal – from houses or anywhere. They hit the people in the houses and took whatever they wanted." Ahmed cleans cars for money – at traffic lights, in traffic jams and at blocked road intersections – and sleeps on the streets, staying awake at night in case thieves assault him, snatching a few hours of sleep after sunrise. Ahmed's parents, like those of many other street children, are alive, but he fell out with them long ago and refuses to go home. Mohamed is only nine and has confused memories of the revolution that overthrew Mubarak. He and another child were assaulted by three men who threw them into a sewer – apparently in an attempt to take money from them. Then, with his brothers, he went to watch the demonstrations in the Gayar district of Cairo. "I started throwing stones at people who said 'no' to Hosni Mubarak. I went on my own with people who said they wanted Mubarak. "They told me to throw stones. The people were older than me." Mohamed is originally from Guena in upper Egypt, from a family of three sisters and three brothers. "I went back to stay with a friend who was sleeping in a garden," he said. "Then another friend started living in Tahrir and told me to come there. So I went with Karim and Ali and Mohamed and we got food there and we sat with the people. I liked going there. I sometimes begged from the people. And the soldiers always said 'hello' to me and sometimes they gave me food." These children – often much younger than they claimed – sometimes avoided questions about police behaviour; they were obviously still afraid. Hostel workers spoke of policemen forcing female street children to sleep with them, even stealing money from the girls. Several children said that most of their friends were on drugs. One young man was clearly addicted and spoke almost incoherently of police violence, of carrying knives, of being repeatedly beaten in the Saida Zeinab police station by two cops, whose full names were given to The Independent on Sunday. Many of the children were sucked into the vortex of the revolution, following crowds out of excitement and a sense of adventure. "People started walking in demonstrations and I just started walking with them," said Goma. He is barefoot and in filthy trousers, and claims to be 16. He is originally from the oasis city of Fayoum and admitted that he didn't know at first whom the people supported. "Then they started saying they liked Mubarak and they walked to Tahrir," he said. 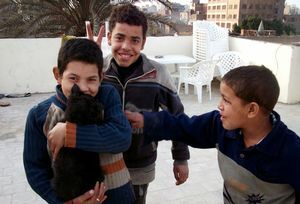 "But when we got into Tahrir, some other people came and threw stones at us. I just threw stones with the Mubarak people. They told me that I should like Mubarak because if he went, some people would come from other countries and become president of Egypt. I got hit by a stone in my back ­ it still hurts. The enemy threw the stone" – presumably democracy protesters – "so I left because I didn't want a stone in my face or my eye." The street children of Cairo move in packs, turning up for free lunches with their friends when hostels open their doors, adopting puppy dogs and trying, like well-educated children, to learn how to use computers donated by foreign charities. But none I met could read – most did not know how to write their own name in Arabic. Some were obviously orphans or semi-abandoned by their parents, but there was a strong theme of fathers forcing their sons and daughters to work the streets for money to buy drugs. The sick go largely uncared for. The dead don't matter. The body of Ismail Yassin, now a martyr of the Egyptian revolution, remains in a hospital mortuary. Unclaimed.